I DON’T WANNA GROW UP!!! Hey Nikki! I have a problem, and it’s that I’m scared to grow up. I just want to stay a kid forever! I feel like I just want to run away and hide, but I know that won’t help me stop getting older. I’m petrified of thinking about going into the world by myself one day and I just want to stay at home forever. Please help me! But you’re right—getting older is going to happen no matter what. So, how do we face it without freaking out ourselves?! I think the first thing is to remember that it’s a looooong process. It’s not like one day you’re going to be watching cartoons and learning your ABCs, then the next day you’ve got a job, a house payment and a leak in your roof. Even after you’ve moved out, it doesn’t have to mean you’re all alone in the world. For one thing, you’ll probably have roommates, whether in a college dorm or a starter apartment. Few young people can afford to live alone. So this will give you some peers to rely on for support. And your parents will always be your parents. If you stay living in the same town, you’ll probably still see them a lot. They’ll still be there for you. Even if you move across the country, your family will STILL be there for you! Plus, you’ll build your own family of people you choose to have in your life as roommates, friends and support for whatever comes up. Also, think about what it is about being a kid that you love. If it’s freedom from responsibility, well, you’re out of luck. But like I said, you’ll have years to gradually learn how to be a responsible adult. But if you’re afraid you’ll have to give up doing fun kid things, you won’t! Here are some of the things ADULTS I know do on a regular basis: roller derby, laser tag, comic conventions, softball leagues, board game clubs, skateboarding, movie marathons, watch cartoons, go camping, and on and on. Being an adult DOES come with added responsibilities. But it ALSO comes with added freedoms! And by the time you’re actually old enough for the responsibilities, they probably won’t seem as intimidating. For now, enjoy being a kid! Try not to spend those awesome kid years worrying about what comes next. And just know that it’s a process and your parents won’t kick you out of the nest before you’re ready to fly! Do you have “Peter Pan syndrome” – afraid to grow up? Or are you in a hurry to be on your own? What’s your favorite part of being a kid, and what do you think will be the best part of being an adult? Tell us in the comments! I’m with you girl. Being an adult is sooooo much work and waaaaayyyyy more responsibilities. I definitely have PP syndrome!! Hey young forever i sometimes hope to grow up you know why?My little sister wont annoy me my WHOLE LIFE & no more bullys ex.Mackenzie . Don’t worry you are going to be just fine! I Love Just Being Served Without Having To Do It Yourself, My Fave part of being an adult Freedom! I agree with Nikki’s advice. Sure, it includes some more responsibilities, but it also adds some more freedoms! Just enjoy being a kid while you can. Once you get older, you’ll realize it’s not that scary. I am sooooooo scared, but I will be sharing my problems with my family and they never let me down!. I’m both- I want to stay a kid so I donb’t have to face everything ahead and could just be a kid forever. But another part of me can’t wait to be a mom, and maybe be a baker or photographer. It’s a little mixed, because I can’t wait to have kids and do the things I love (why can’t I start that now? Maybe I should) but I also don’t want to face all the drama of being an adult. 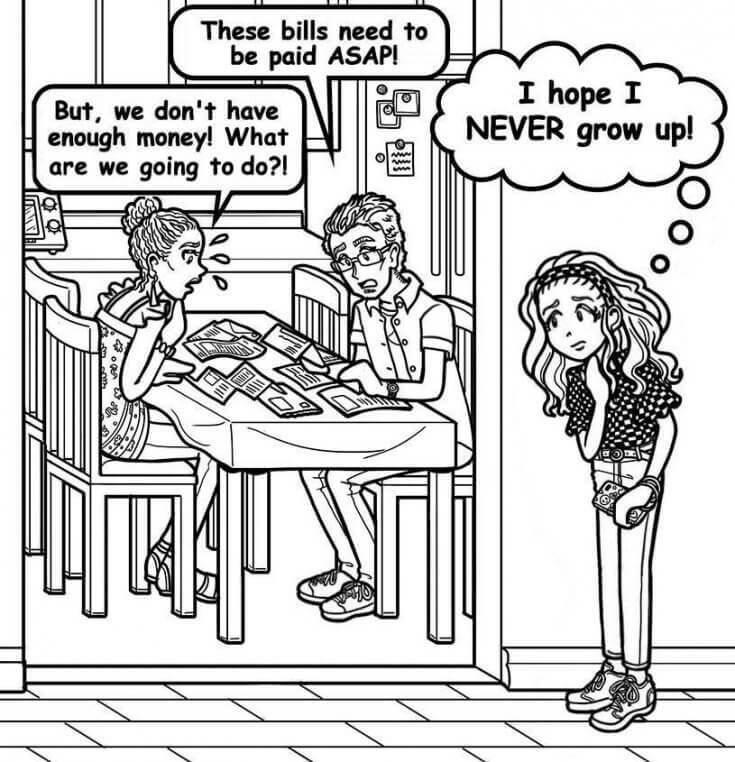 I never want to grow up, too! I don’t want to grow up too so thank you for answering my question. Nikki u give gr8 advice and forever young I want u to know that everything’s gonna be okay ur not alone I’m like that to ok I’m sure there’s lots of other girls out in the world that wonder what it’s gonna be like when there older and r scared about a lot of things like me and u like taxes, bills and much more but we’ll get over it because u know why were kids and we have a stronger heart than any adult. Thank u bye!!!! thanks for helping. me nikki love ya books❤❤✌✌!!!!!!!! !